- Bring this to any party or as a home welcoming gift. Embrace your love of both travel, adventure and a good whiskey/scotch. Perfect gift: groomsmen gift - best man gift - wedding gift for the groom - Graduation gift - Father's Day gift - Anniversary gift for him - Gift for whiskey lovers and for all occasions. The sails and ship have a amber hue which makes this a beautiful home piece. A perfect gift for the Bourbon, Scotch, or Wine connoisseur. Includes glass decanter stopper and Mahogany stained wood display. Decanter dimensions: 10" h x 4- 1/2" W X 6" D. Beautiful with handcrafted details: Mahogany stained wood display and a unique antique ship indie. 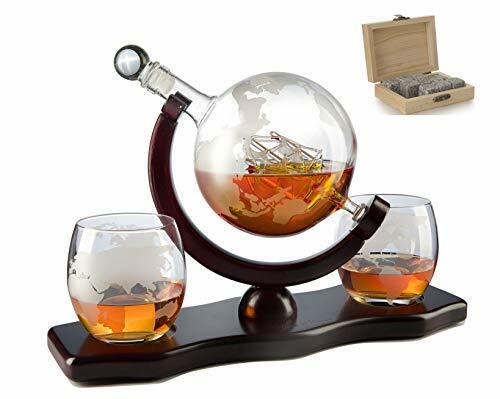 With 2 Globe Glasses and Whiskey Stones For Whiskey or Wine With Antique Ship And Matching Globe Glasses Mahogany Stained Wood, HOME BAR DECOR - The Wine Savant World Decanter - This beautiful mouth blown globe decanter is a must have. This decanter will aerate your wine or any beverage as well. An absolute must decanter and glasses: This decanter is a must have for the adventurer or the true connoisseur. Perfect gift: groomsmen gift - best man gift - wedding gift for the groom - graduation gift - Father's Day gift - Anniversary gift for him - Gift for whiskey lovers and for all occasions Impress with this truly unique gift: This decanter will make anyone admire the artfully detailed antique ship, beautifully set in the etched globe decanter. We recommend this to be hand washed. - Artisan crafted - an absolute must for the connoisseur and savant: Every bar should have this impressive display decanter and glasses. This decanter set with globe glasses is a must have for the adventurer or the true connoisseur. This beautiful diamond decanter is the perfect gift for any wine or whiskey connoisseur hand crafted by artisan craftsman, Birthday, it's shape is unique and gives a royal feeling to any place setting Make for a perfect gift Makes for a great gift for any occasion, Valentines day, Love, Anniversary, Husband Boyfriend home welcoming gift or just because! Impress your bar set with diamond style with this large whiskey diamond decanter:Great as a starter of finishing touch for any bar. If your'e not 100% satisfied simply contact us for a full refund. Beautiful wood mahogany:the mahogany stained wood display with 2 diamond glasses are a beautiful match, pair with your favorite scotch, whiskey, wine or port. Perfect gift: makes for a great gift for any occasion, Valentines day, Anniversary, Love, Birthday, Husband Boyfriend home welcoming gift or just because!. The Wine Savant Diamond Whiskey Decanter l With 2 Diamond Glasses Liquor, Scotch, Rum, Bourbon, Vodka, Tequila Decanter - Satisfaction guaranteed: love it and gift it. This is a hand crafted carefully constructed DIAMOND decanter with diamond glasses, will make anyone admire the artfully detailed diamond shape spirits decanter, and it's symmetrical mahogany base. • JoyJolt Atlas 5-Piece Crystal Whiskey Decanter Set,100% Lead-Free Crystal Bar Set, Crystal Decanter Set Comes With A Scotch Decanter-22 Ounces And A Set Of 4 Old Fashioned Whiskey Glasses-10.8 Ounces. - Professionally crafted and designed, this is a beverage decanter that's simply a must-have for any whiskey connoisseur. Beauty you'll want to share this whiskey decanter with glasses uses dazzling glass craftsmanship coupled with a unique diamond shape design that exudes elegance, high class and sophistication that you'll want to show to your guests, at parties or formal gatherings. The perfect home for all your beverages!our novelty glass whiskey decanter with stopper is perfect for storing wine, brandy, whiskey, and other liquors along with fresh juices and other liquids. Beautiful wood mahogany:the mahogany stained wood display with 2 diamond glasses are a beautiful match, whiskey, pair with your favorite scotch, wine or port. Perfect gift: makes for a great gift for any occasion, Anniversary, Birthday, Love, Valentines day, Husband Boyfriend home welcoming gift or just because!. Satisfaction guaranteed: love it and gift it. If your'e not 100% satisfied simply contact us for a full refund. Handcrafted elegance: handmade and hand-blown by skilled craftsmen, this diamond shape whiskey decanter is designed to provide you with an elegant and stylish way to impress all your guests and leave a lasting impression. Diamond Whiskey Decanter With 2 Diamond Glasses & Mahogany Wooden Holder – Elegant Handcrafted Crafted Glass Decanter For Liquor, Scotch, Rum, Bourbon, Vodka, Tequila – Great Gift Idea – 750ml - Artisan crafted - an absolute must for the connoisseur and savant: Every bar should have this impressive display decanter and glasses. This decanter set with globe glasses is a must have for the adventurer or the true connoisseur. It comes with 2 high-quality diamond shaped glasses and a beautiful Mahogany wood holder to make sure you have everything you need to enjoy drinking by yourself or to entertain guests. • 5-Piece European Style Whiskey Decanter and Glass Set - With Magnetic Gift Box - Exquisite Diamond Design Liquor Decanter & 4 Whiskey Glasses - Perfect Whiskey Decanter Set for Scotch Alcohol Bourbon. Greener Chef Cheese Board 1351 - What are you waiting for? It makes the perfect gift for birthdays, you've found it! With its elegant design and gorgeous 100% lead-free Mahogany wood base, Anniversaries and any other occasion you can think of. 100% risk-free purchase: we make customer satisfaction our top priority which is why we go the extra mile to make sure you get the finest. The perfect housewarming gift or wedding gift! ideal for all cheese types - cut, gouda, Camembert, Blue Cheese, serve and present your favorite Mozzarella, Parmesan, Feta, Monterey Jack, Edam, Cheddar, Brie, Provolone, Gorgonzola, Pecorino Romano, Ricotta, Halloumi or any other fromages you like. It comes with 2 high-quality diamond shaped glasses and a beautiful Mahogany wood holder to make sure you have everything you need to enjoy drinking by yourself or to entertain guests. Lightweight & easy to carry: the last thing you want is dragging around heavy and easily breakable glass decanters which is why we've designed our diamond decanters to be thin, Tequila, and lightweight to help preserve the crisp, Vodka, Rum, Bourbon, Scotch, rich texture of your Liquor, and any other beverage. Beautiful Bamboo Cheese Board & Knife Set For Mom, Mother, Housewarming & Wedding Gift | Elegant Wood Meat Platter Charcuterie Set | Exclusive Cheeseboard With 4 Cheese Knives & Conditioning Oil Spray - A gift worth giving: looking for an elegant and practical gift that will impress? well, christmas, new Years, this drinking bar set is a must-have for any true connoisseur or anyone that just wants to add more elegance to their homes décor. Beautiful wood mahogany:the mahogany stained wood display with 2 diamond glasses are a beautiful match, whiskey, pair with your favorite scotch, wine or port. Perfect gift: makes for a great gift for any occasion, Anniversary, Birthday, Love, Valentines day, Husband Boyfriend home welcoming gift or just because!. Satisfaction guaranteed: love it and gift it. Each purchase is backed by our 100% Customer Satisfaction Warranty so that you can order today knowing your purchase is risk-free. Design Toscano SJ45001 - Opening from its hinged meridian to reveal artistically hand-painted interior frescoes reminiscent of domed ceiling contraspecto "view from the heavens", our Toscano-exclusive work of furniture art boasts secure spots for your treasured bottles and glasses. 21 lbs. If your'e not 100% satisfied simply contact us for a full refund. Handcrafted elegance: handmade and hand-blown by skilled craftsmen, this diamond shape whiskey decanter is designed to provide you with an elegant and stylish way to impress all your guests and leave a lasting impression. World globe bar cart - our liquor cabinet is the best place in the world for your port, brandy, whiskey decanter and stemware! Design Toscano Sixteenth-Century Italian Replica Globe Bar Cart Cabinet on Wheels, 38 Inch, MDF Wood, Sepia Finish - Each purchase is backed by our 100% Customer Satisfaction Warranty so that you can order today knowing your purchase is risk-free. Impress all your friends with the most elegant cheese board and enjoy amazing moments of cheese and wine tasting with your loved ones. Artisan crafted - an absolute must for the connoisseur and savant: Every bar should have this impressive display decanter and glasses. This decanter set with globe glasses is a must have for the adventurer or the true connoisseur. The greener chef premium cheese board and knives set is here to help you dazzle your friends thanks to its beautiful and eye-catching design. A trio of handsome, turned hardwood legs rises from rolling casters and a circular lower shelf, allowing additional storage and a celebration that can be moved anywhere! Simple assembly required. • Etched World Decanter Globe Decanter, with Antique Ship and 4 World Map Glasses by The Wine Savant, Great Gifts for Dad, Boyfriend or Anyone! Godinger Decanter Globe - Can also be used to serve water, juice, Soda, iced tea and other beverages. Since 1973 godinger has specialized in handcrafted silver, bakeware, crystal, pewter, barware, and alternative metal giftware. Spoil your wife, husband, friends or parents with the Greener Chef bamboo cheese platter set today! Our cheese platter board set comes with 4 different cheese knives 1 x chisel, 1 x spreader, 1 x semi-heart shaped knife and 1 x cheese serving fork so you can cut, spread and serve your favorite cheeses. Protect & condition your beautiful cheese serving tray with our professional-grade conditioning 100% walnut oil spray, which will restore your cheese platter's natural colors and shine while maximizing your cheese plate's durability. What are you waiting for? From wedding gifts, tea sets and frames, stainless, candlesticks, you are sure to find the perfect item for any special occasion. 850ml - Godinger Whiskey Decanter Globe Set with 2 Etched Globe Whisky Glasses - for Liquor, Scotch, Bourbon, Vodka - Home bar cabinet - our portable pub opens from the globe bar caddy's hinged meridian, to hold your glasses, decanter bottles and alcohol. Beautiful wood mahogany:the mahogany stained wood display with 2 diamond glasses are a beautiful match, whiskey, pair with your favorite scotch, wine or port. Perfect gift: makes for a great gift for any occasion, Birthday, Love, Valentines day, Anniversary, Husband Boyfriend home welcoming gift or just because!. Satisfaction guaranteed: love it and gift it. Godinger products are available at all major retailers across the US and Canada. NIFTY5 0117N5 - Its radiant glow in any drink will surely be an attention grabber at any occasion. Silicone tip tongs and storage tray included - With every purchase we include a silicone-tip tong for your convenience and a storage tray to keep them in any freezer compartment. Gift ready box packaging - a modern, and nifty package design for your whiskey stones makes it a great, elegant, complimentary gift for anyone and for any occasion and special holiday. Specially designed for whiskey, tasteless, etc. The greener chef premium cheese board and knives set is here to help you dazzle your friends thanks to its beautiful and eye-catching design. Great conversation piece at any party. World globe bar cart - our liquor cabinet is the best place in the world for your port, brandy, whiskey decanter and stemware! Whiskey Stones Gold Edition Gift Set of 8 Stainless Steel Diamond Shaped Ice Cubes, Reusable Chilling Rocks including Silicone Tip Tongs and Storage Tray by NIFTY5 - Spoil your wife, husband, friends or parents with the Greener Chef bamboo cheese platter set today! High quality - hand-crafted with solid hardwood legs, mdf and applied paper maps, our push bar carts on wheels can easily be moved. Our liquor cabinet home bar cart measures 22"dia. X38. 5"h. Hand blown elegant whiskey decanter dispenser featuring an etched globe design and antique ship in the bottle will undoubtedly enhance your drinking experience while making a bold impression. • Art Deco Premium Quality Lead Free Crystal Whiskey Decanter Set With 4 Glasses In Unique Elegant Gift Box. Dishwasher Safe. The Original Art Deco Liquor Decanter Set For Whisky, Scotch Or Bourbon. KG W QN W - Or him and Queen for the Mrs. Or Her. High quality - hand-crafted with solid hardwood legs, mdf and applied paper maps, our push bar carts on wheels can easily be moved. Usa made, and printed with beautiful, designed, intricate graphics. Vivid white print is easy to see and won't wear off. The cubes are made of food grade 304 stainless steel, wine, VODKA, and environmentally friendly, iced COFFEE, making it the perfect addition to all of your favorite drinks and beverages that are best enjoyed cold. King wine glass for the Mr. What are you waiting for? Gold stopper adds a touch of class while keeping your spirits sealed. Lead free decanter capacity: 850ml - Cocktail glass: 300ml. Simple assembly required. Design toscano liquor cabinet - Impress guests with the Old World charm of our Italian style rolling globe bar caddy liquor cabinets for home. King and Queen Wine Glass Valentine's Day Gift Set - 12.75 oz ea.- Cool Present Idea for Bridal Shower, Engagement, Wedding, Anniversary, Newlyweds & Couples - Gift for Mom, Women or Friends - Artisan crafted - an absolute must for the connoisseur and savant: Every bar should have this impressive display decanter and glasses. This decanter set with globe glasses is a must have for the adventurer or the true connoisseur. Dishwasher top rack only safe. Unique gift that's perfect for engagement parties, mom or dad, anniversary, him or her, wedding, and newlyweds, husband or wife. • Elegant Home Personalized Gift Set of Two 19 Oz. Queen & King Stemless Wine Glass - unique Novelty - Gag Gift. • Mr & Mrs Gifts, set of 2 Crystal stemless wine glasses, with beautiful gift box, Perfect Engagement Gift, Wedding gift, Anniversary or Couples gift. - Pint glass and a delicious Vino For Her From a 12. 75 oz. Our glassware is designed, made and packaged in the USA. Making it perfect home furnishings! Can also be used to serve water, juice, Soda, iced tea and other beverages. Since 1973 godinger has specialized in handcrafted silver, bakeware, crystal, barware, pewter, and alternative metal giftware. Our liquor cabinet home bar cart measures 22"dia. X38. 5"h. Gold stopper adds a touch of class while keeping your spirits sealed. Lead free decanter capacity: 850ml - Cocktail glass: 300ml. Now you can cut and serve your mozzarella, brie, gorgonzola, stilton, Parmigiano- Reggiano, Roquefort or feta cheese like never before. Mom Dad Valentine's Day Gift - Him, Her, Mr. Mrs. - I Drink And I Know Things Beer and Wine Glass Set- Cool Present Idea for Bridal Shower, Wedding, Engagement, Anniversary and Couples - A must have cheeseboard set for every cheese expert who wants to enjoy his/her favorite fromages like a pro. Need a cool gift for a bridal shower, housewarming, or hostess or host? your search is over! Funny beer and wine glass sets are also great for Christmas gifts, bachelor's party, holiday office parties, stocking stuffers and dirty santa / white elephant gift exchanges Imagine their face when they open the box to find "I Drink And I Know Things" beer and wine glasses. Each purchase is backed by our 100% Customer Satisfaction Warranty so that you can order today knowing your purchase is risk-free. Impress all your friends with the most elegant cheese board and enjoy amazing moments of cheese and wine tasting with your loved ones. Great conversation piece at any party. • Hand of the King Beer Bottle Opener Game of the Thrones style gold & silver with magnet & gift box. Vintorio VOWA1 - Making it perfect home furnishings! Celebrate your tyrion game love - enjoy an ice cold brew for him from a frosty 16 oz. Pint glass and a delicious Vino For Her From a 12. 75 oz. Gold stopper adds a touch of class while keeping your spirits sealed. Lead free decanter capacity: 850ml - Cocktail glass: 300ml. Hand blown elegant whiskey decanter dispenser featuring an etched globe design and antique ship in the bottle will undoubtedly enhance your drinking experience while making a bold impression. Patent pending set includes whisky decanter with 2 matching globe design old fashioned whiskey glasses fitted onto mahogany stained tray. This glass decanter set is a must-have for the whiskey connoisseurs and bar owners that want to add more class to their home, bar, or office. The full bar set: this diamond whiskey decanter with glass decanter stopper is simply a must have for anyone that wants to make their drinks more enjoyable. Premium Decanter For Wine Lovers - Vintorio Wine Aerator OMNI Edition - With Gift Travel Pouch - The omni ultimate wine aerator by vintorio because life is too Short To Drink Bad Wine. World globe bar cart - our liquor cabinet is the best place in the world for your port, brandy, whiskey decanter and stemware! Our cheese platter board set comes with 4 different cheese knives 1 x chisel, 1 x semi-heart shaped knife and 1 x cheese serving fork so you can cut, 1 x spreader, spread and serve your favorite cheeses. 5" cheese serving tray set is the perfect housewarming gift or wedding gift idea for every cheese enthusiast. Our cheese platter board set comes with 4 different cheese knives 1 x chisel, 1 x spreader, 1 x semi-heart shaped knife and 1 x cheese serving fork so you can cut, spread and serve your favorite cheeses. Bullet Chillers Set of 6, The Wine Savant Stainless Steel Whiskey Rocks Bullet Shaped Ice Cubes, Beautiful Gift Box, Tongs and Storage Bag - Whiskey Stones Bullets Stainless Steel - Protect & condition your beautiful cheese serving tray with our professional-grade conditioning 100% walnut oil spray, which will restore your cheese platter's natural colors and shine while maximizing your cheese plate's durability. High quality - hand-crafted with solid hardwood legs, mdf and applied paper maps, our push bar carts on wheels can easily be moved. Don't dilute your ice, remain in classy style while enjoying your favorite beverage. No tricks, no gimmicks, just fine wine. Inspired hassle free design - unlike other wine aerators, but also is one of the easiest to use, or get lost. Making it perfect home furnishings! The omni is the best and last wine aerator you will ever own.